There are 5 main scripts in Genomon-exome for analysis. * If the FASTQ files are compressed, unpacking may occupy some amount of time. We'll store fastq files in an organized manner using tools. There two tools, Type 1 and Type 2 for this purpose. If your fastq files aren't output in the manner explained below, please prepare directories yourself. This is for fastq files processed with CASAVA ver. 1.8 or later. 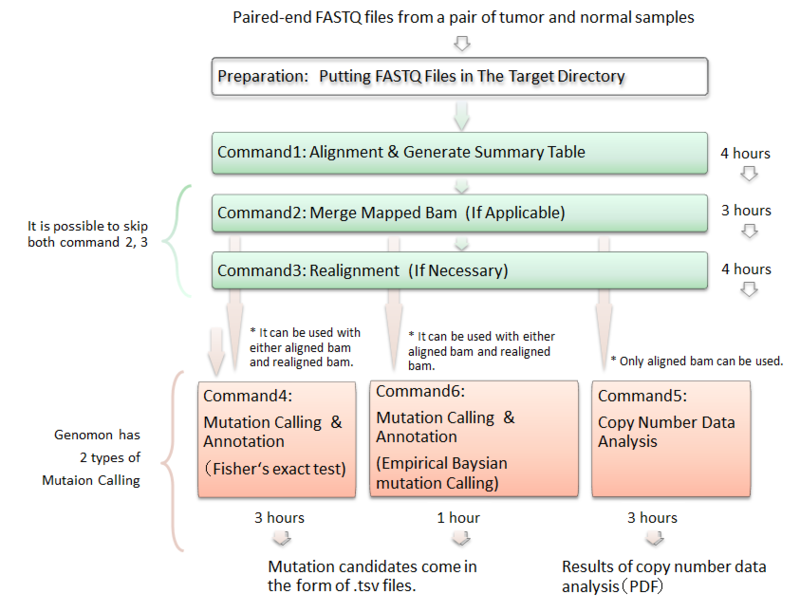 Please put your fastq files in the exome/data/input_org directory. # arg3: Run Date, the date the data were taken. It is important as the same sample gets sequenced more than once. # arg4: sample type - normal, tumor, TAM, AMKL, CR, you name it. # The -f option should be used if fileter is required. # If there are reads to be filtered in casava1.8, use the -f option. # Below you see the results. Types 1 and 2 share the output dir structure and the format. If above doesn't apply to your dataset, your fastq files should be found under the exome/data/input_org directory. This Type 2 tool needs to be exec'ed for each file in the exome/script directory. That's all we have to do to store fastq files. Once the directories are made and file names are fixed, please don't touch them as programs used in the later steps assume that. After alignment is finisehd, we calculate alignment rates and coverages. The shell should be executed in the exome/script directory. After you executed the qsub command, the job id will be returned on the screen. Please take the ID number, it is needed to take a look at the logs later. If you have couples of bam files that are made from the same sample (say tumor sample), but sequnced independently, you cam merge them together. Multple sequencing may be needed when we need more depth, if that happens you can merge the mapping result bam files together. A "merge" dir will be created and the merged bam files are put in there. Please execute the script in the exome/script directory. # arg1: bam files to be merged. comma seperated full path required. # arg3: sample type - normal, tumor, ... etc. # The resulting bam file, ga.bam is placed under the dir below. Here we do realignment. The job submission scprit should be executed from the exome/script directory. # arg2: Run date, if there's a merge dir Run date is set to merge. We execute a data analysis shell script that in the exome/script directory. # For Fisher test. If a read have more than this val, dropped. # If your jobs failed, go look at files under the result dir. These are useful when debugging, please keep them. # These are the temoprary files. In the next release these are removed. The script should be executed in the exome/copy_number/script directory. # arg5: optional you can change the config file. copy_number/script/copynum.env is used by default. # If you submit two jobs simultaneously, tags should be unique. You can check the completion status here. /home/genomon/exome/data/sequence/normalreference10.bam  # Removing last blank line. # in the exome/eb_call directory. # arg6: optional you can change the config file. ebcall/config.sh is used by default. Copyright © 2012 Laboratory of DNA Information Analysis, Human Genome Center, The Institute of Medical Science, The University of Tokyo.